Three weeks after my first trip to Sidney by the Sea, I went back once again on a day trip with several more of my relatives to fish and catch crabs. The journey to Sidney was pretty much the same as last time: we caught the 9 o’clock sailing to Swartz Bay and arrived at the pier at around 11:30. The crabbing was pretty good the last time, but this time it was even better. We kept catching really big red rock crabs. With our three traps, we caught a dozen or more legal-sized red rocks, but we only kept the biggest eight because we only had two fishing licenses. The smallest red rock we kept was 14cm across the carapace. That’s pretty big considering legal size is 11.5cm. Our largest catch was a massive 16cm across the shell, making him almost on par with Dungeness crabs. 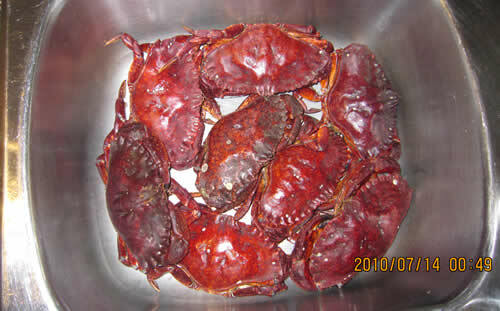 My relatives and I have never caught so many big red rocks in one trip, and we were definitely impressed with the crabbing at Sydney. On the slight downside, we didn’t get any legal-sized male Dungeness crabs. All the big Dungenesses we caught were large females which we cannot keep. 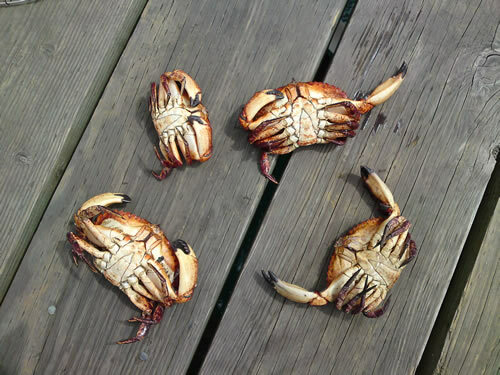 Four red rock crabs we caught from the first trap we lifted. Two of these red rocks were quite large. Compared to our successful crabbing efforts, fishing was a letdown. We didn’t catch anything and don’t know if we got any bites either. This could be because a seal was hanging around in the area, scaring all the fish away. The one or two times that we felt something on our lines, it was actually crabs that were eating the bait. After around two hours on the pier, we went for lunch at Fish on 5th, right across from the bus stop back to Swartz Bay. I had two pieces of haddock with yam fries, and it was quite good and not too expensive. 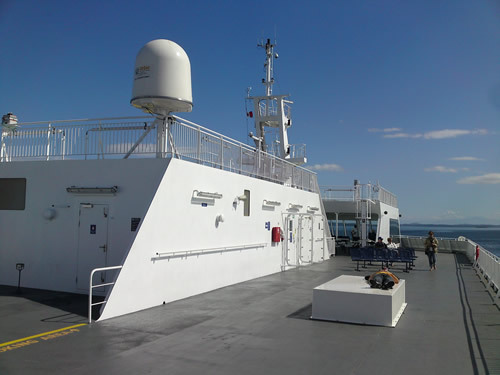 On the sailing back to Tsawwassen we got on a newer ferry called the Coastal Celebration. 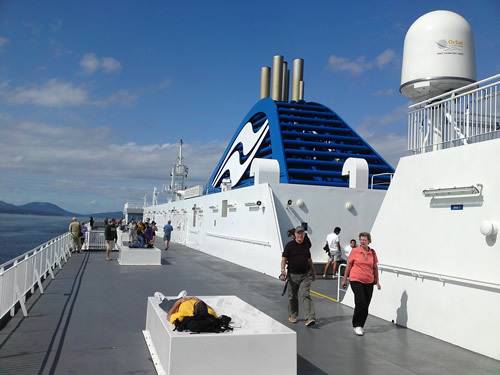 Our last three trips were on the Spirit of Vancouver Island. 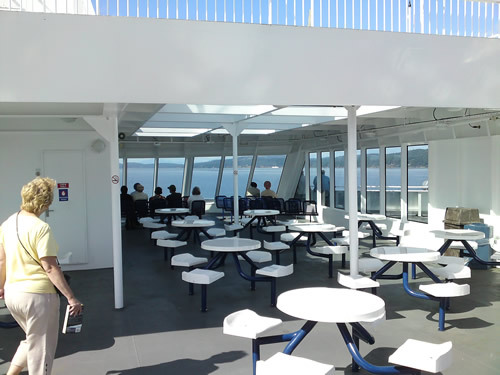 Compared to the Spirit of Vancouver Island, the Coastal Celebration had a larger outer deck area at the top and I spent a lot of time outside, watching the scenery of the Gulf Islands. I saw otters, seals, and even bald eagles feeding on the waters. Supposedly there were also killer whales, but I didn’t see them. Once again, my day trip to Sidney has been a fun experience. I’m still full from eating all the crab we caught. Of course, I didn’t eat all of them by myself, but it was a lot of crab. I might return there again some time in the future, but it’s hard to say when it’ll be.